AND THIS IS THE REASON WHY is a regular feature where invited CCF supporters, volunteers and fund holders share their ‘why Cornwall’ and ‘why CCF ‘. The same 12 questions asked of the contributors provide a fascinating insight into Cornwall and what really matters to people passionate about the county. 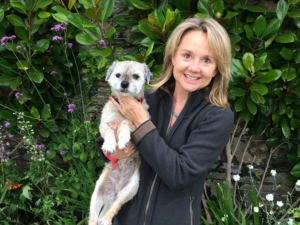 Kim Conchie, a Trustee of the Foundation, has always felt Cornish. He says that it annoyed his father who was from Somerset that he and all his siblings supported the land of his mother, Cornwall, when they played Somerset – and everybody else – at rugby. When he sold his business in London, Sarah and Kim made the decision to move out. The big decision was – Helston or Falmouth? Fortunately, Sarah, Welshwoman, had fallen in love with the same patch over many holidays. They chose Falmouth, moved there with Henry, aged 9, Charlie 6, Florence 3 in 2002. Kim hasn’t regretted it for one moment. What a town! Why are you passionate about Cornwall? My mother was brought up in Cury on The Lizard but her parents were from Mousehole and Newlyn so I feel particular affinity with all SW Cornwall although actually, I love every inch of it. I have never felt such a complete sense of place since coming here to live permanently in 2002. Share a treasured memory about Cornwall with us. Dancing the Midday Dance with my sister Kate, Flora Day 2008; and Auntie Jill playing the organ at Gunwalloe Church, the sun shining every day at Poldhu, and more recently, singing with friends in The Chainlocker, being on our boat in Falmouth Bay. What Cornish sight makes your heart sing? Bottle of Camel Valley (full); pint of Lushington’s or Proper Job (full). Care to share your favourite corner of hidden Cornwall? What do you see as the most pressing issue in Cornwall? Correcting the low wage economy in some of our key industries. What would you change about Cornwall if you could? Be more upbeat about ourselves and our achievements. What inspired you to support the CCF? I want everybody in The Duchy to share in the success we’re starting to achieve as new industries and jobs emerge here. Cornwall is made up of lots of communities and CCF seems to me the best way of reaching out, cheering people up and spreading the love and pride in the place we all feel. Where do you think the CCF can help the most in Cornwall? When you are out of Cornwall, what do you miss most? What one word would you choose to sum up your Cornwall? Your favourite Cornish place name? Give us a Cornish Language word! Two here: Stank = a good walk. Splann! Splendid! 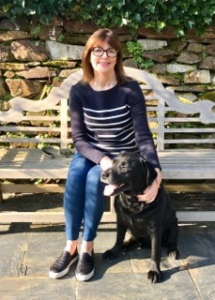 Jane Trahair was brought up in Tavistock and after a few years in London, moved to Landrake in Cornwall in 1983 with her husband, Julian , after the birth of their first son. Her time has been spent running an interior decorating business and later as an adviser at Citizens Advice. She joined the Friends of CCF committee in 2017 and was invited to be Chairman this year. I am passionate about Cornwall because I feel a strong sense of belonging here. My husband’s family have lived in Cornwall for generations and my family always spent summer holidays here. My most treasured memories are from childhood – surfing, sailing, hunting for cowrie shells, hopping over the rocks on north coast beaches. I never tire of the sight of Cape Cornwall and the Brisons from Carn Gloose, St Just. They say the Rame Peninsula is in Cornwall’s Forgotten Corner but it is one of my favourite places to visit from Landrake where we live. My other role is as an adviser at Citizens Advice where we are at the sharp end of Cornish issues. Fuel poverty, where more than 10% of income is spent on fuel and electricity is a problem for many, along with delays in benefit payments. It is clear that many Cornish people will never break free from the poverty trap. Improve the rail link to the county. I love the fact that CCF supports so many worthy causes in Cornwall from sports clubs to mental health charities to helping those in need during cold winters. The Friends particularly support charities for disadvantaged young people – immensely rewarding. CCF is in the fortunate position of being able to identify areas of particular need and can target its funding where that need is greatest. Blue – the colour of the sea, the sky and Cornishware pottery. Give us a Cornish Language word. Tre – Cornish word for home or homestead of, the prefix of so many Cornish names like Treluggan, the name of our house. Sarah has been working for the Foundation as Grants Administrator since 2014. Having moved from West Sussex to the South West in 2000, she now has lives in Launceston with her husband Mark and daughter. 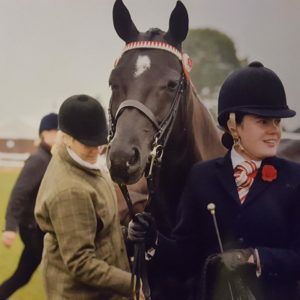 All of her spare time is taken up with caring for the family’s horses, being the horsebox driver and the behind-the-scenes person of her daughter’s competition exploits. Because of its beauty, history and diversity. My daughter and her pony being supreme Champion in her class section at The Royal Cornwall Show, not only once, but twice. The view from the A3072 heading from Red Post into Bude near Thurlibeer Farm and the ‘Welcome to Cornwall’ sign coming along the A30 into Launceston, especially when returning from a horse show on the other side of the country. St Clether Holy Well Chapel, on the edge of Bodmin Moor in the Inney Valley. It is the most quiet and peaceful place I have ever visited. I wanted to help make a difference to those struggling in Cornwall. Providing small grants to local grass roots groups. The dark nights with no light pollution. Treniffle, which is a small hamlet just on the outskirts of Launceston. Has to be ‘dreckly’ but obviously isn’t a true Cornish word – but it certainly is a word which I believe sums up the Cornish way of life. Tamas Haydu, CEO of the Cornwall Community Foundation, joined the CCF in 2013 and was appointed as CEO in March 2017. Tamas moved to Cornwall from Hungary 9 years ago after visiting Cornwall many times. He lives in Launceston with his wife Clare, and two young daughters. Having our wedding ceremony at Treneglos Church followed by the reception at Crackington Haven with pasties on the menu. Deprivation and rural isolation. Unfortunately many people can’t enjoy what Cornwall can offer. I would love to improve people’s skills. Our Vital Signs research highlighted that more than 99,000 people in Cornwall have no qualifications. Supporting a wide range of small, volunteer-led, grasroots organisations who often find it difficult to attract funding from anywhere else. The CCF is able to connect people who would like to give to the local community with projects that make a real difference. We can reach disadvantaged and isolated people through local projects that are embedded in their communities. Born, bred and still living in North Cornwall, my husband and I live in a Grade 1 listed home and enjoy sharing its story and history with others. My father’s family originated from St. Buryan and my mother’s ancestors were light house keepers on the Isles of Scilly. I have always lived on a farm and we remain active farmers. My life has centred on the farming community, church and village life, with additional interests including music, WI and my seven grandchildren. Our four daughters and families now live within four miles, having moved back to Cornwall. The Cornwall Community Foundation (CCF) efficiently administer my Ruth Burden Community Trust grant. The primary purpose of the trust is to support small voluntary groups within my immediate local area. It has always been home for me, unique, beautiful, green and with such friendly people. Travelling to Tregonebris, Sancreed, when very young to stay with relatives, being driven to Liskeard and put on the Royal Blue bus to Penzance on my own. It seemed a long way. Marrying Neil at our local Methodist Church at Ladycross, Werrington, where I had been the organist since the age of thirteen and where my family were very involved in Methodist and Bible Christian tradition, which gave me a good grounding of the Christian faith. More recently, watching the Miracle Theatre group perform on the cliffs in front of Bedruthan Steps Hotel, with the sea view as a backdrop as dusk set in and enjoying the atmospheric show despite intermittent heavy rain. The cast were quick thinking to be able to include reference to the rainbow in the play. Every day, the changing scene of nature from my window of sky, shrubs, trees, flowers and wildlife I can see. Amazing. Ruses Mill. The steep hill was used annually for the Land’s End to London veteran car rally as a hill stop. It’s a real find. Also, the Cheesewring near Minions, which always entails an exhilarating walk to get there. The isolation of so many. The size of living accommodation in new housing developments – rooms are too small, no storage, no outside play areas or privacy and limited parking. I have been applying for grants to benefit my community for over twenty years. I have found having a central source of advice on grant aid, which CCF offer, as invaluable to my efforts. Helping small groups that would not otherwise be able to exist. Captivating – with its meaning being fascinating, charming, holding interest. Crowlas, Ludgvan – I enjoy writing this word down, we have relatives living there. Also, Tywardreath – when proof-reading our local book ‘Glimpses of a Cornish Rural Community: Trebullett and the Parish of Lezant’, in 1994, we failed to pick up it was spelt with a ‘y’. Myttin da mentioned daily on Radio Cornwall, meaning good morning. 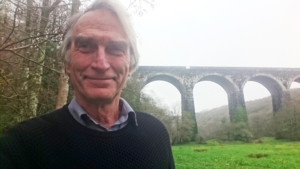 Jonathan Angilley was born and bred in Cornwall and has spent most of his life working within the China Clay Industry. He completed fifteen years with English China Clays and after four years with Cornwall Care went back when he joined Goonvean in 2001. Following the sale of the China Clay operation to Imerys in 2012 Jonathan remained with Goonvean and their other businesses. Goonvean are C100 Business Club members and in 2017 generously supported CCF with a £25,000 donation for our fund development work. 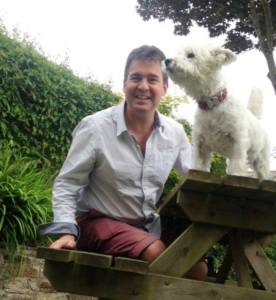 He is married to Fiona, lives in Truro and when not working enjoys walking their dog Darcey. Wherever I go I am happy to come home. Polkerris Beach as a child when time seemed to pass so much slower. It isn’t actually hidden …Holywell Bay … whatever the weather. Poverty and a lack of true representation on the real issues. CCF? It is fulfilling a real need. Surprisingly recently a decent pint and a cheese and onion pasty. 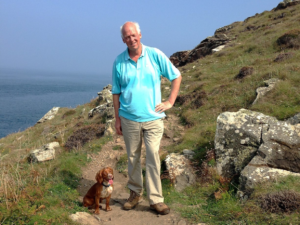 Tom Van Oss has been passionate about Cornwall from his teenage years holidaying in Rock and Trebetherick and, for the last 20 years, at his equal-first home on the Helford River. With his wife Sarah he spends as much time as possible in paradise, although his day job is advising on mergers and acquisitions in London. They have three daughters who are in their twenties. He was a governor of Falmouth University and is presently a member of Council at the Royal College Art and a committee member of The Courtauld Institute. The county is a part of me but very much apart from the London me. Proposing marriage to Sarah at the top of Brea Hill. The first glimpse of the sea as you drop down towards Gweek from the road to Helston. Lankidden, but I’ll kill you if you tell anyone. Affordable housing, a challenge that us second home owners make more acute. Make all who holiday here realise that there are disadvantaged people who need their support. I wanted to give something back. At the micro-level, but also at the macro: we need to get more political. Predannack. It might be the oldest Cornish place name. My youngest daughter, a linguist, says that Ps and Bs were interchangeable, so Predannack could be the antecedent of “Britain”. I first came to Cornwall in my teens from the Isle of Wight where I was born and raised, on a family holiday to Fowey – little did I suspect at the time that I would end up marrying a Cornish girl and moving here to live in 1993, quite by chance as a job came up in St Austell and we wanted to move from Essex to be nearer to family. Now some 24 years on we have lived in our home just outside St Austell for 22 years with our two children and have parents and so many friends living nearby. We have thrown ourselves into our community, from school Governor to Pantomime Dame and enjoy every minute of living in such a fantastic County. It is truly a privilege to live and work in such a beautiful place. The scenery whether moorland or coast changes so much depending on the season and weather that it never ceases to surprise and delight. I am passionate about giving back in whatever way I can to the County which has been home for me and my family for the last 2 decades. My first visits to Looe where my wife grew up, fantastic New Year’s Eve fancy dress pub crawls and then being able to get married at St Martin’s Church some years later. A new discovery this year – the hidden beaches between Pentewan and Mevagissey only accessible by boat – or in my case kayak – beautiful! Increasing wages – so many people earn minimum wage or equivalent it’s no wonder they can’t afford housing and move away to get better paid jobs elsewhere. If we can attract the right sort of industry and professions which pay higher salaries we can break the cycle and keep the next generation in Cornwall. Otherwise we are doomed to be an ever aging population and will lose our vibrant youth. The traffic especially in the summer months! The opportunity to be involved in setting up the C100 Club which brings together like-minded businesses who together want to make a difference. A perfect example of how CCF can be used as a vehicle to create and sustain projects. Providing the small grants that can get projects off the ground and be used as building blocks to enable sustainability. The Sea – nowhere else can match it! Marazion – a favourite place but especially memorable after a friend from Essex rang to say they were staying at Marzipan!! Dreckzel – threshold of a doorway – a favourite of my father-in-law! Emma Mantle (née Perkins) was born in the county and lives here with her husband David, and family on the south coast. Her father was involved in the fund in the early years and having spent her teenage years trying to get out of Cornwall the inevitable yearning to come back took over. 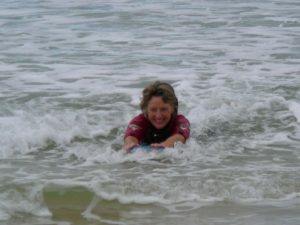 Emma is a Trustee of the Foundation and chair of the Events Committee and is dedicated to raising awareness of the CCF. Having been born and bred in Cornwall I feel it is an intrinsic part of my being, it has so many diverse places and opportunities. 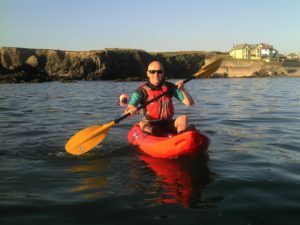 So many I don’t know how to choose… getting married in Mylor, rowing on Scilly, riding on the beach, sailing in Carrick Roads – what a great place to be! Walking the dogs around Trefusis point and looking across to St Anthony lighthouse. Gwenva, well worth the walk and a stones throw from Sennen. Cornwall is busier for more of the year due to the success of tourism so more investment is needed in the infrastructure, particularly roads and hospitals. The inequality and the weather! I care very much about our incredible county. The CCF plays in important roll with smaller grants and, more importantly, every penny stays south west of the Tamar. We have such a diversity of wealth, the CCF has the ability to identify where the grants can be given for maximum effect. Home – oh no, I have just seen that Jonathan said that too! Lamorna – A beautiful place and a song that makes me smile! Jonathan Cunliffe has been in Cornwall (or the water around it!) since he was 3, and both his parents were born in the county. Having lived on both the north and south coasts, he now lives in the same road he grew up in, with his Welsh wife Verity and their three young children. 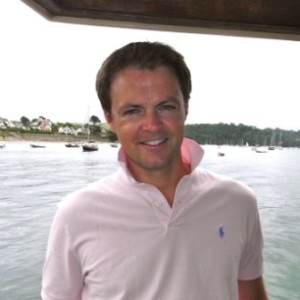 Based in Cornwall, Jonathan runs his own property agency buying and selling prime property in Cornwall. He is also a trustee of the National Maritime Museum in Falmouth. Having previously sailed competitively at home and abroad, he is happiest when on or in the water with his family. Because of its landscape, coastline, history and people. Also it is the ‘end of the line’ and so has a wonderful island feel. Share a treasured memory about Cornwall with us? My wife and I came back from a day-trip to Scilly years ago and went looking for Nanjizel that evening. We ended up at the coastgaurd lookout on Gwennap Head and the next ship coming round that south west corner of England was named Verity – the same as my wife. There are so many, but I love seeing Mounts Bay and St. Michael’s Mount as one drops down from Penzance on the A30. Balancing local housing needs with the dangers of over-development in such a beautiful part of the world. I would try and narrow the gap between rich and poor. It is really important to me to see that every penny raised by the CCF stays in our county. Through its ability to be able to get much needed funds to so many smaller charities, groups and organisations. The smell of salt in the air. Deborah Hinton (nee Vivian) returned to Cornwall after many years of exile, living and working in London. She has been actively involved in the voluntary and the statutory sectors at national and local level for over 45 years, as a board member, trustee, director, employee and volunteer in organisations covering a wide range of issues from special needs housing, through mental illness, death and bereavement, to criminal justice and horticulture. 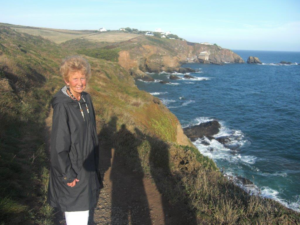 Now she spends her time striding along the cliff tops, making ceramic mermaids and supporting Cornwall’s rich culture, its theatre and arts; she is a Board Member of the Royal Cornwall Museum and the ‘Visitor’ for the Henry Smith Foundation for Cornwall and South Devon. 1. Why are you passionate about Cornwall? Because it is my home, my family have been here since the 12th century, it is part of my identity and where I belong. 2. Share a treasured memory about Cornwall with us? The unveiling of the portrait of my ancestor Sir Richard Hussey Vivian cleaned and re-hung at the top of the marble staircase at the Royal Cornwall Museum, from whence it had been unceremoniously removed some fifteen years previously. My crowning achievement. 3. What Cornish sight makes your heart sing? Carn Brea – from the A30, the beating heart of Cornwall. 4. Care to share your favourite corner of hidden Cornwall? St Winnow Churchyard, overlooking the Fowey Estuary, the family burial place and arguably the most beautiful churchyard setting in Cornwall. 5. What do you see as the most pressing issue in Cornwall? Inequality largely between rich incomers and an impoverished indigenous population. 6. What would you change about Cornwall if you could? The lack of low cost housing and decent jobs that leads to the mass exodus of the Cornish young people. 7. What inspired you to support the CCF? The Community Foundation with its ‘bottom up’ approach provides seed corn finance at local level where it is most needed, it demonstrates how much can be done with very little. 8. Where do you think the CCF can help the most in Cornwall? CCF can create real change at grass roots level and help to mitigate the worst effects of Universal Credit. 9. When you are out of Cornwall, what do you miss most? Cornwall itself, there is nowhere to compare with it. 10. What one word would you choose to sum up your Cornwall? 11. Your favourite Cornish place name? Playing Place – derived from Plen an Gwari, uniquely, across Cornwall in medieval times there were thirty eight ‘Plen an Gwari’, open air theatres, for theatrical and sporting events and for performing the Ordinalia. 12. Give us a Cornish Language word! ‘ Hiraeth’ – A yearning to return to that which no longer exists or never existed, it is untranslatable. 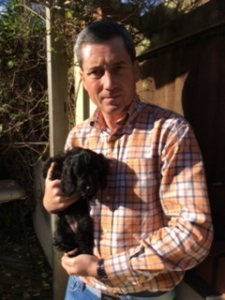 Tim Smith was born and brought up in London but has lived in Cornwall since 1999. He had a small accountancy practice in Launceston which he sold last year so that he could retire. Now he plays tennis, gardens and does other voluntary work. He is a Cornish convert. 1.Why are you passionate about Cornwall? Since I came to Polperro on holiday in 1954, I have loved everything that Cornwall has to offer; the beautiful coastal scenery, the ruggedness of Bodmin Moor, the market towns and the delightful villages. A wonderful holiday at Widemouth Bay in 1970: great surfing, hot Cornish pasties, an excess of scrumpy, all to the tune of In The Summertime by Mungo Jerry. The Camel estuary, one of the loveliest places in the whole world. 4. Care to share your hidden corner of Cornwall? Tregardock beach, it is worth the climb down, try playing beach cricket at low tide. Low incomes: Cornwall is the poorest county in England, we need better paid, less seasonal and more secure jobs. The infrastructure: we need better roads, better rail services and better broadband. Eddie George: he was passionate about the CCF and so was Vanessa. I learnt from him how the CCF could make a difference. With deprivation, in the most deprived areas in our towns and villages. 9. When you are out of Cornwall what do you miss most? 10. What one word would you use to sum up Cornwall? 11.Your favourite Cornish Place name? Nicky Marquis was born & grew up in Cornwall, went away for university and work but returned to live in 1999. 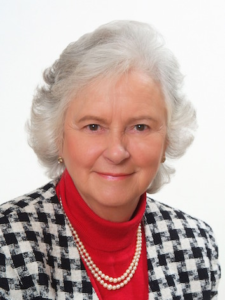 She volunteered for CCF, & became a Trustee in 2014, bringing her HR expertise to help. Born here, it’s deep in my soul. Going to Church Cove, Gunwalloe after school on summer afternoons when I was a little girl…& eating jam sandwiches. Swooping down the A30 & crossing the Tamar. The beech wood hidden in the valley below my house. The lack of affordable housing. Getting funds to small voluntary groups – even relatively small amounts can achieve so much. The CCF team are so knowledgeable about matching funds to deserving projects. James Williams was born at Tregullow, grew up in Cornwall, travelled the world for work… and came back with Sarah (who was captured from Devon). He became a Trustee of CCF in 2003 and was chairman for 7 years until 2014. He was Chairman of Falmouth University for eight years and he is a member of the Council of the Duchy of Cornwall. 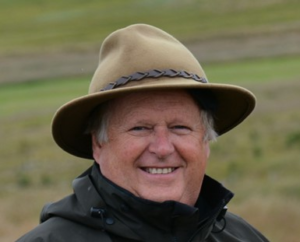 Every two years he leads the group that selects the winner of the Trelawny Plate to celebrate the Cornish person who embodies true ‘Cornishness’. He walks the coastal path with unruly spaniels, body boards wet suit free at Porthtowan, and farms the most delectable Red Ruby Cornish beef. Perranzabuloe or Goongumpas have impact, but Chacewater brings with it all sorts of mysterious associations and must be the favourite. Kirsty Philpott, Grants Manager at the Cornwall Community Foundation for 11 year, born and bred in Cornwall. 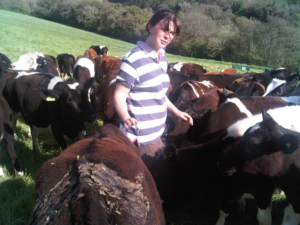 Kirsty enjoys all sports including running – as it’s the best way to see the Cornish countryside and helping on the family farm. It’s my home and that of my families, we are so lucky to live in a place of many different landscapes and traditions. I am not sure its treasured however seagulls and ice-creams come to mind, need I say more. 3.What Cornish sight makes your heart sing? The countryside and new born lambs. The family farm, the place I grew up, which has now been in the family for over a century. Cornwall, like most counties, has many issues and working at the Foundation has opened my eyes to many of these. What currently alarms me is the amount of families, mostly working, accessing support from the foodbanks. More support for our traditional industries, they make Cornwall what it is today. Local people, local projects, local money. The greatest thing about the Foundation is that it is so diverse and we can be both proactive and responsive to areas of need, meaning many issues can be supported. Da bo na? meaning: alright or no? 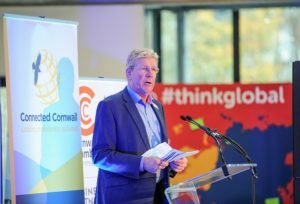 Oliver Baines, Chief Executive of the CCF until March 2017, now an Ambassador for the Foundation – I came to Cornwall as an innocent in September 1981. Within a month it had captured me. With all its different facets, its cantankerousness and generosity, the Cornish love of life and celebration, and our amazing natural diversity – it all created an irresistible attraction for me. While its traditional industries were, and still are, in a parlous state, its people have remained resilient, tough, self-reliant and proud. How could you not fall for such an extraordinary place? Because I love its sheer diversity, of people, landscapes, wildlife, lifestyles. Because living in Cornwall is all about being passionate. My first visit to Botallack, in the autumn of 1981, with blue skies and raging seas crashing into the rocks below the Crown mines. That was the moment that I fell in love with Cornwall. Our viaduct (we call it the Brunel viaduct though it’s not) across the water meadow by the Fal next to our house. Thirty years after I first saw it, it still takes my breath away. The secret sandy beach at Hemick on the south coast, only approachable through a tunnel at low tide. Perfect. The housing crisis, the result of shocking inequality. I’d like it to be much, much more self-sufficient. It’s a fabulous organisation. It presses all the right buttons about local giving, making small grants to create real difference, covering every inch of Cornwall. It treasures the things that really matter – social and community life, volunteer activity, love of place and people. These are troubled times. The CCF can reinforce the social safety net that supports our precious communities. Oh dear. Splattenridden, Lanteglos, Hantergantick, Nancegollan, Ardevora Veor… there are hundreds of wonderful names! The late Lady Mary Holborow DCVO was Lord-Lieutenant of Cornwall for 17 years and the first Chairman of the Foundation. Lady Mary was very involved with the CCF as Vice President and was a dedicated volunteer of the Friends Committee. 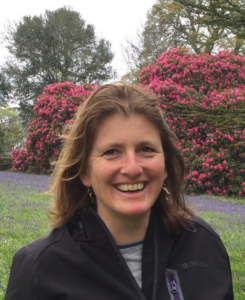 Caroline Dudley, OBE, an archaeologist and formerly Director of the Royal Cornwall Museum in Truro, has been a volunteer at CCF HQ for the past three years. Caroline’s experience is invaluable in helping the CCF’s grants team in administering grant schemes. Cornwall is where I was born and brought up, and I am proud to come from a long line of Cornish men and women, most of them with connections to the mining industry. Long summer days on the beach at St. Agnes with our family almost every day in the school holidays, unless it was actually raining! Picnic lunches with homemade pasties, Corona pop and Neapolitan ice cream between two wafers. I love the Cornish coast, from the cliffs at Hell’s Mouth to the bay at St. Ives, the incomparable river estuaries of the Fal, the Camel, the Helford and Fowey, Marazion, Lamorna Cove – I could go on! Chapel Porth, my mother’s favourite cove. Replacing the investment which may be lost after we leave the EU. Cornwall still needs major improvements in infrastructure if it is to redress the inequality in the county with the rest of the UK. Cornwall has made such enormous strides since I was a child, and I want to see all the good things that have happened continue to develop. 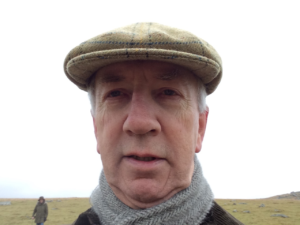 I wanted to use my experience to contribute something to Cornwall when I retired, and as I have had experience in administering grant schemes the CCF seemed like an excellent fit. I think the CCF does a marvellous job in directing funds to those mainly small organisations all over Cornwall who do such an invaluable job in supporting the disadvantaged in our communities. The landscape, the light, the soft air and the historic towns and villages. 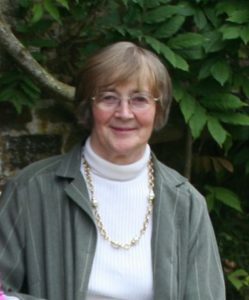 Ann Higham, second home owner in Fowey for 17 years, is an active supporter of the CCF Cornwall Club and the Second Home Owners Scheme. It’s where our family is happiest. For me Cornwall has a strong sense of place. Remembering our children out exploring the nearby woods by themselves, experiencing that freedom and excitement. Catching the first mackerel of the Year, the smell of wild garlic then inventing new ways to cook them. 4.Care to share your hidden corner of Cornwall? Bedruthan steps and lost up the river Fowey on a high tide are both mystical places to me. Low awareness that pockets of Cornwall have very severe poverty levels and the lack of diverse career opportunities for the young to create long and meaningful livelihoods. I would change people’s current perception of Cornwall as a county of tourism, Poldark and Doc Martin. There’s a thriving university, a world class food industry, high speed internet for technology and creative industries and a great renewable energy sector, to name a few. But many more are needed. The Cornish community has done so much to make us feel welcome over the 17 years. 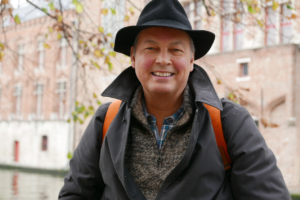 After arriving as an outsider I had the preconception that I was going to be treated as such. Whether it be at the pub quiz or participating in the carnival, locals are so welcoming; I felt that it was time that I contributed and gave back. At the grassroots level, I am always impressed by the way that the CCF grants impact directly and positively on people’s lives, providing that crucial helping hand. The air, the light, the walks and the people. Chacking, hope I’m right and this means thirsty! Mark Mitchell, Chairman of Cornwall Glass Ltd and formerly Vice Chair of the CCF, was born and has lived in Truro most of his life. 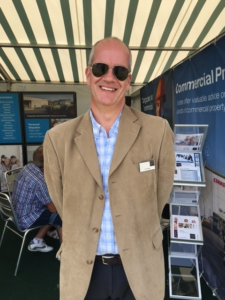 Mark worked from the age of 18 in the family business that now employs over 200 people at 16 sites across the South West of England. Cornwall Glass established their named fund in 2009 and since then the Cornwall Glass Fund has invested a total of over £50,000 in community projects across Cornwall. It’s my home, I’m a born and bred Cornishman and I lived here for all of my 46years! I love the pace of life and the wonderful, genuine characters in our community. It was being able to walk all my four children to the same local primary school, at the same time. I gave me such a sense of belonging with a hint of nostalgia…it was the school I attended as a boy too. An easy one to answer; Perranporth Beach from Liskey Hill when the tide is out, walking along the wonderful stretch of sand, then heading off for some cakey tea. If I’m allowed I’d like to share the Isles of Scilly – the scenery, the unique light and the tranquillity. For me it’s affordable housing and the proliferation of second homes as well as the importance of allowing our children to be educated in their first choice local school, especially at primary level. It’s a bit cheesy but even on a grey day if you look through those clouds the sun shines brightly. We have a successful family business, providing for 250 families in the South West and we wanted to make a tangible difference by establishing a charitable fund for the wider benefit of our local community. The reach of the Foundation is far and wide within our wonderful county. The team have unrivalled local knowledge, matching much needed funds to both deserving and make a difference causes. Apart from my own bed, the view of Truro Cathedral. Lowen teylu – Happy family. I’m hoping you’ll let me have it as one word! Jane Hartley, High Sheriff of Cornwall, has lived in Cornwall for over 25 years with her family, where she has set up a holiday business. 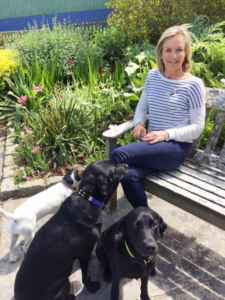 Jane, Chair of the CCF, is an enthusiastic Cornish philanthropist. 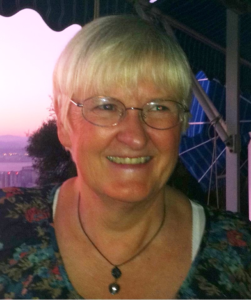 Her family charitable trust – the Albert Van den Bergh Charitable Trust – has established a named fund with the CCF. I love Cornwall for its countryside, beaches and people. There is something about living in Cornwall that you feel free and you can be yourself at whatever tasks you set yourself. Following a hard day’s work the beach and the beautiful countryside is so accessible for a quick run with the dogs. I moved to Cornwall 27 years ago and my parents-in-law very kindly gave a drinks party to celebrate Rob and my engagement. Someone very kindly said to me I would never be accepted by the Cornish, I would need to live here for at least 40 years. Only in Cornwall would a comment like that be said! I feel 27 years on having been asked to be High Sheriff of Cornwall I have been accepted. That is the joy of Cornwall, there are no rules. Easy. Running out to the cliffs between Holywell Bay and Polly Joke looking over towards Trevose head. The views up the coast are spectacular, but in May/June are unbelievable, with the sea pinks and wild blue orchids bursting out all over. Holywell Bay. It is such a special beach, no sign of civilisation can be seen from any direction. Sunset over Gull Rocks; the best. It makes me sad to think that we live in this beautiful county and it is still the poorest. While I enjoy the beauty so many people are struggling to survive. Very little. I would like this supposed EU funding to directly benefit the lives of the many people in Cornwall who really need it. I would also like the Cornish to have a more upbeat approach to life, on a sunny day they can’t resist but to say ‘oh it will be raining tomorrow’. I wanted to give back to the county that I love. I think they are doing an excellent job at trying to improve the quality of life of people and communities in Cornwall. If we were able to get more philanthropists interested in supporting CCF we could make a much more significant difference. There are gaps, area we are unable to support. With more support CCF could make a larger impact on the community we live in. The freedom to run walk and swim out in the countryside.